To provide some context, let’s go down memory lane. The internet launched circa 1995. Prior to that, advertising was the lead marketing strategy and tactic. In 1960, marketing professor and author E. Jerome McCarthy defined marketing as the Four P’s: Product, Promotion, Price and Place. As recent as 1973, Webster’s dictionary defined marketing as the advertising of products and services. To reference a famous tagline, “You’ve come a long way baby.” Today, advertising is a secondary tactic for all but the biggest brands, primarily consumer and retail. Internet marketing and social media have become integral to the modern marketing mix. Let’s take a closer look at modern marketing, inbound vs. outbound, traditional vs. digital. Our Modern Marketing Mix Infographic illustrates all aspects on marketing, along with interrelationships. Many pundits decry that traditional marketing is obsolete. We at Modern Marketing Partners don’t subscribe to this ballyhoo. Rather, marketing has evolved. Modern marketing is an evolved mix of strategic marketing, traditional marketing, internet and new media, and better results measurement. Modern marketing is more effective. More cost efficient. More measurable. More targeted. More social and mobile. Take a look at our Modern Marketing Mix below. We agree with what Hubspot is pioneering as Inbound marketing. Upon closer analysis, it’s clear that Hubspot is focused on Internet and social media, not traditional marketing. Modern Marketing Partners has developed, implemented and proven the power, effectiveness and leverage of Integrated Marketing Communications or IMC, with a modern twist. Integrating traditional marketing with internet marketing and social media for one purpose, results. Marketing and sales results. Leads and orders. Not soft measures like Twitter Followers or Facebook Likes. Want to know more? Register for RSS feeds of this blog, above. You can sign up for our free marketing e-newsletter. Register for our free training webcasts announce in this blog. Please share this with your network via our sharing tools below, or our social profiles above. Qualified marketing departments can request a Modern Marketing Executive Briefing™, that shares the Modern Marketing Process™, along with a custom analysis of modern marketing readiness. For more info, email Questions@ModernMarketingPartners.com. Of course in the spirit or modern marketing, and social media, please bookmark and share this blog via the tools below (Facebook, Twitter, Share, Google+), and do comment with your own experiences and suggestions. 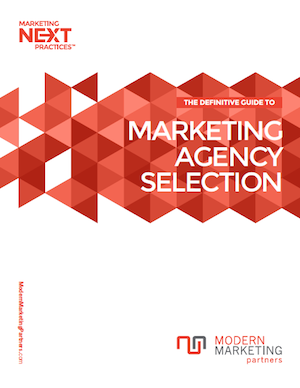 Modern Marketing Partners, a Chicago B2B Marketing Agency, has announced a whitepaper on Modern Marketing Definitions. Download Glossary of Modern Marketing Definitions today!